Skulduggery and Valkyrie are facing a new enemy: Baron Vengeous, who is determined to bring back the terrifying Faceless Ones and is crafting an army of evil to help him. Added to that, Vengeous is about to enlist a new ally (if he can raise it from the dead): the horrible Grotesquery, a very unlikable monster of legend. Once Vengeous is on the loose, dead bodies and vampires start showing up all over Ireland. Now pretty much everybody is out to kill Valkyrie, and the daring detective duo faces its biggest challenge yet. But what if the greatest threat to Valkyrie is just a little closer to home? 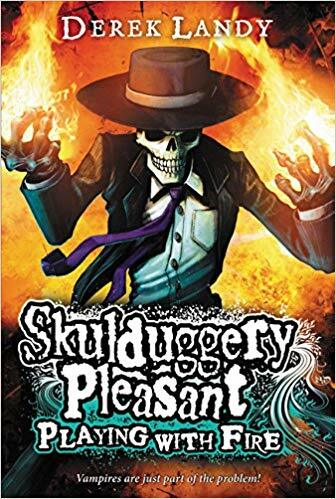 The second book in the Skulduggery Pleasant series was very similar to the first one except that it didn’t need the whole introduction to the world. The action came right away because the characters were already known. I think the level of sarcasm was a little bit lower than the first? It felt more serious. Not necessarily a bad thing, but the thing that sold me to this story, was the sarcasm and witty dialogue. So that was a small bummer. On the upside though, the story is very much alive and I was extra surprised in the second half when I actually realized that Landy doesn’t write about details. Like for instance, Valkyrie wears a dress, but there is not a single descriptive word about it. Yet, he totally makes it realistic and visible somehow. Very good job, Landy! This sums up to a grade of 4. There was also this short story Gold, Babies and the Brothers Muldoon. Refreshing short story of 26 pages with lots of funny dialogue. I guess it is easier to make a short story incredible with 85% sarcasm. In a whole novel, it shoulnd’t take over. What good would a book be if it was only great because it was funny? There has to be a great story to be told as well. But in a short story, it wors perfectly.